Safe Borders or an Unsafe Future? Following a review of the most recent developments in the region, this issue of ShiaWatch considers the situation on Lebanon’s eastern and southern borders. Based on the conditions exemplified by those borders, it questions the appropriateness of continuing to characterize as "antagonistic" the relationship that exists between the Lebanese State and Lebanon’s primary non-state actor, Hezbollah. Within weeks, two major Lebanese leaders, Saad Hariri—while speaking about Syrian asylum in Lebanon, and Hassan Nasrallah—while addressing the failure to pass a new electoral law, warned that Lebanon is on the verge of breakdown. Certainly, the warnings they proffered must be taken seriously. Still, Lebanon’s relative calm in comparison to its neighbors makes it difficult to decipher, or even to take seriously, its critical situation. Another factor increasing the opacity of this situation is the prevalence, out of political correctness, to describe Lebanon’s ills as a succession of “political crises” involving “political actors”, instead of labeling things using their more obvious names, and acknowledging that these “crises” go beyond politics—or to be more precise, “beneath politics”— and actors involved are “political” by metaphor. This edition of ShiaWatch offers some views on Lebanon's slow but steady relapse…which seems increasingly unavoidable. At various times during recent years, a rather Byzantine debate has ebbed and flowed regarding the veracity of characterizing Hezbollah as having a “political wing” and a “military wing.” Yet following General Michel Aoun's election as president (Hezbollah’s candidate) and the formation of a government given the kitschy and vacuous title of “national unity,” Hezbollah’s political opponents—and their patrons—have effectively surrendered. At this point, then, those amateurs who still aspire to join the debate over Hezbollah's nature can now start arguing over its two "new" wings. The first is the “domestic” wing, through which Hezbollah brokers “Lebanese” deals and with which it is politically acceptable (from the perspective of its domestic opponents) to partner, while the second, the “regional” wing, takes the kind of action that is well beyond any Lebanese questioning. And while such amateurs will be happily continue to theorize about all this ad nauseam, the fact remains that given the current regional balance of power and Western disinterest in dealing strategically with Middle East problems, Lebanon must be seen now and well into the future as a collateral bonus, which Iran obtained through its efforts in the Syrian war! Following a vacancy of 29 months, Lebanon’s presidency was finally filled on October 31, 2016 by 83-year-old former Army commander in chief General Michel Aoun. Elected by the Lebanese parliament during a particularly rocambolesque session, Aoun was Hezbollah’s candidate, who ultimately gained support from his former political foes. This development, remarkably similar to the kind of bargaining that led to the formation of Lebanon's so-called “National Interest” government (which captained the country as best as it could during the long vacancy), is far from being any genuinely Lebanese achievement. The biggest difference between these two "eras," which were conceived to help preserve Lebanon’s stability (a condition so dear to the international community) is that the arrangement is steadily less able to hide the effect of the shifting regional balance of power on Lebanon. the cartoon that appears above. Understandably, that caricature attracted a substantial amount of attention. a small-scale attack on the Beirut offices of ash-Sharq al-Awsat and the halfhearted apology/clarification that was buried in the newspaper, this caricature conveys words that are typically proscribed when diplomacy is involved. In April 2013, Saudi Arabia's ambassador to Lebanon told Lebanon’s As-Safir newspaper that his country’s “doors and hearts” were open to Hezbollah. In September 2014, a delegation from Hezbollah attended the Saudi national day celebration hosted by the Saudi embassy in Beirut. Among the many other attendees at the event, that delegation was especially conspicuous in extending their best wishes to the Kingdom’s representatives. These two cordial exchanges are simply examples of the long history shared by Hezbollah and Saudi Arabia, which has experienced a number of “downs,” but numerous “ups” as well. 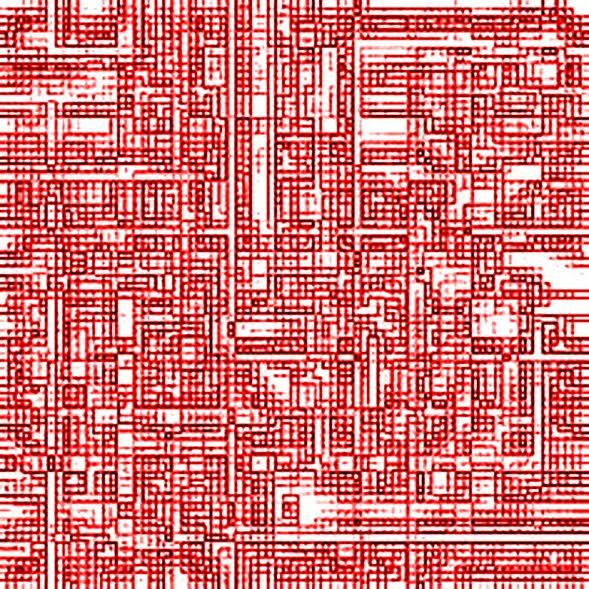 So what the hell happened? What prompted Saudi Arabia, a country known for its conservative and “orderly” approach to foreign policy, to label Hezbollah officially as a "terrorist" entity? Why would the Saudis—apparently arbitrarily—suddenly hold Lebanon's coalition government responsible for the actions of its non-state "partner," since they were fully aware of the extant Lebanese balance of power? This edition of ShiaWatch suggests that a comprehensive understanding of recent Saudi moves not only requires a review of Hezbollah's ostensible "promotion" to the rank of full regional actor, but also an examination of the "recently revised" Saudi approach to the leadership of Lebanon's Sunni community. Above all, it draws attention to the abundant changes Saudi Arabia has been experiencing since the January 2015 death of King Abdullah…. 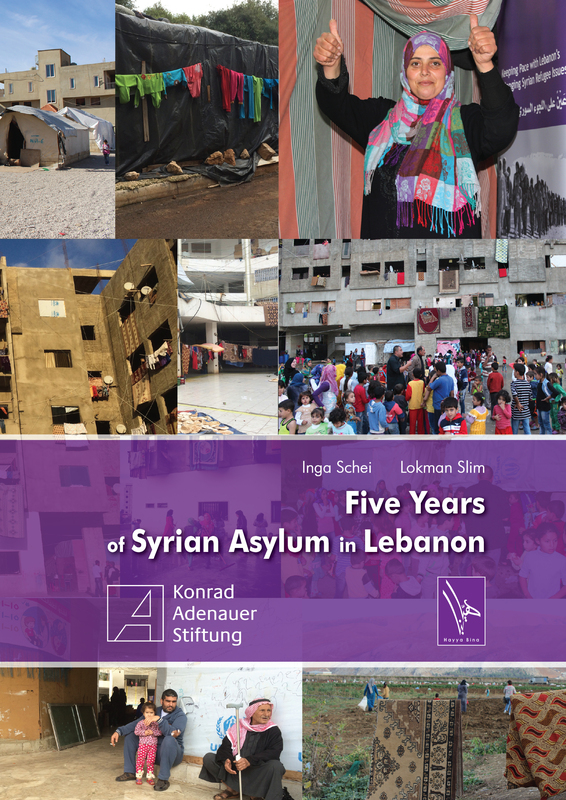 This report, among several deliverables that accompanied a partnership between Hayya Bina and Konrad-Adenaur-Stiftung (which also included extensive documentation and fieldwork), serves as a primer on the convoluted progression of this "issue" from 2011 to 2015. 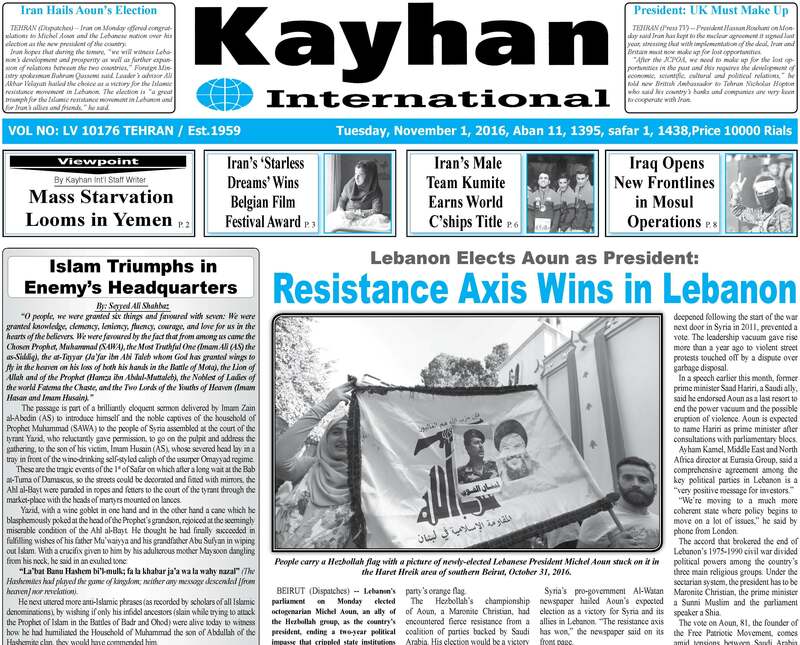 As readers will certainly note, while the perspectives on Syrian asylum in Lebanon have slowly changed, the prospects for their resolution in the near term are nothing short of grim! 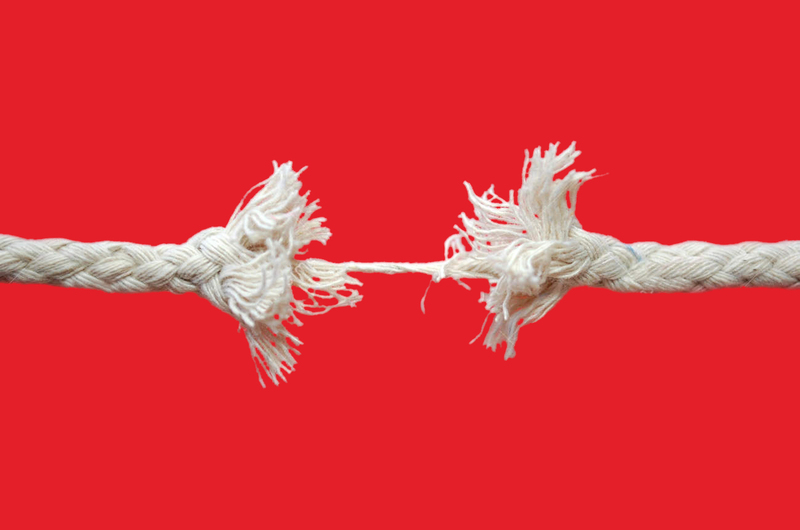 The introduction to this report, part of a USIP-funded endeavor, is titled “Stability vs. Instabilities.” When Hayya Bina completed its draft in mid-2015, that title seemed particularly well suited to conveying the turbulent and frequently violent conditions that affected Lebanon during the period covered by that analysis (2013 – 2014). As we release that report, however, those same conditions have continued to affect Lebanon…. 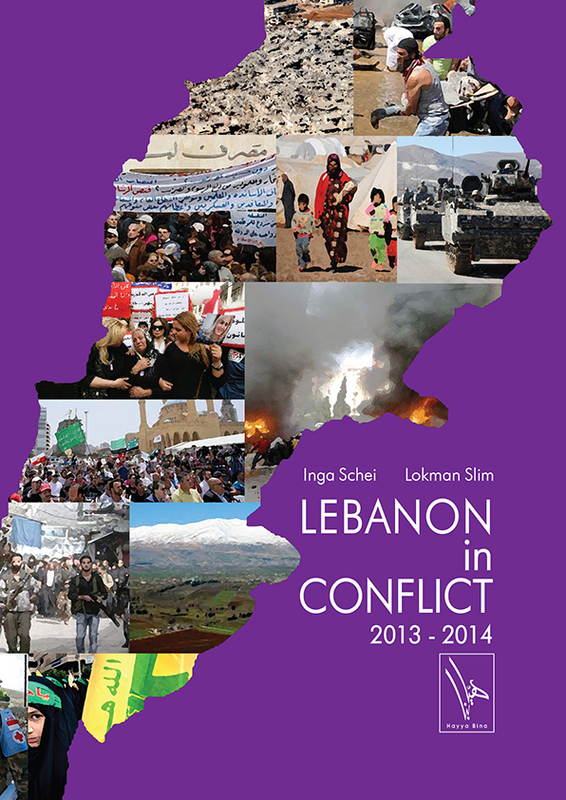 While this report covers the period 2013-2014, we believe the eight chapters contained therein, either separately or as a whole, may facilitate the development of a realistic and informed assessment of the asymmetric form of equilibrium Lebanon has been able to maintain within what has emerged as a particularly explosive regional framework. 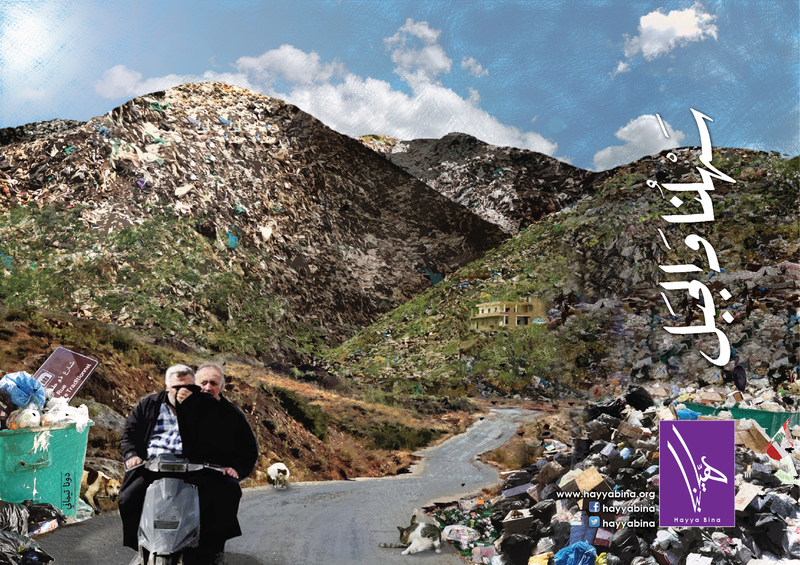 A poster produced by Hayya Bina in early 2015 that focuses on the now-famous “garbage” situation. 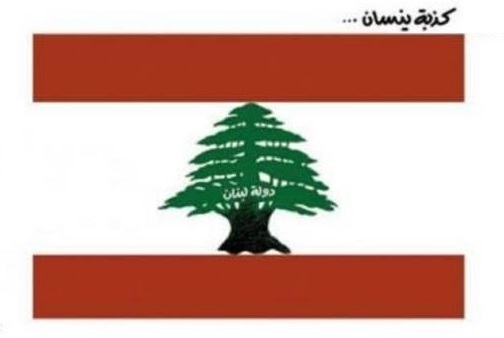 The caption is composed of two words taken from Lebanon's national anthem: “Sahlouna wal-Jabal” (“Our valley(s) and mountain(s) [are hotbeds of manhood]”!). The poster was created by Dona Timani. Since August 22, Lebanon has been forced by the popular protests associated with the “garbage crisis” to observe a very different rhythm. Interestingly, this ongoing development (re)opened Lebanon's Pandora's box almost immediately and released the many pungent smells it has hidden for so long. In keeping with established Lebanese tradition, it will always be too early to assess the real legacy of the garbage "uprising." Although Lebanese have no specific predilection for such exercises, we believe it is the least to do considering the country's vacuous causal nexus of suffering and doom. In that sense, it is imperative to take some stock from that ongoing situation, which we do herein by shedding light on the more intrinsic factors being impacted, reawakened or exacerbated. In this Alert, we examine these aspects, which include the diffuse tension that exists between Lebanon’s security and military bodies, the degree of loss each of the political components has endured and the complex, yet heated sectarian context within which the protests are proceeding. In 2013, Hayya Bina oversaw the first public opinion poll to focus on Lebanese Shia. The survey was conducted in Dahiyeh, which is home to the largest aggregation of Shia in Lebanon, the members of which hail from various regions throughout the country and represent the entire spectrum of social classes. 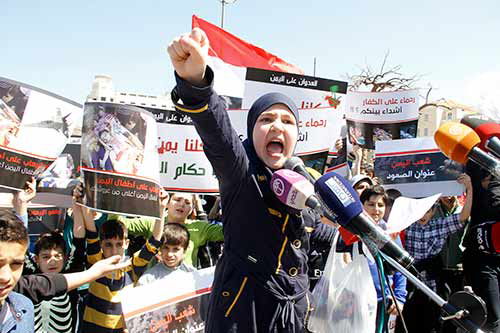 Then, in 2014, the organization conducted a second poll in Dahiyeh. 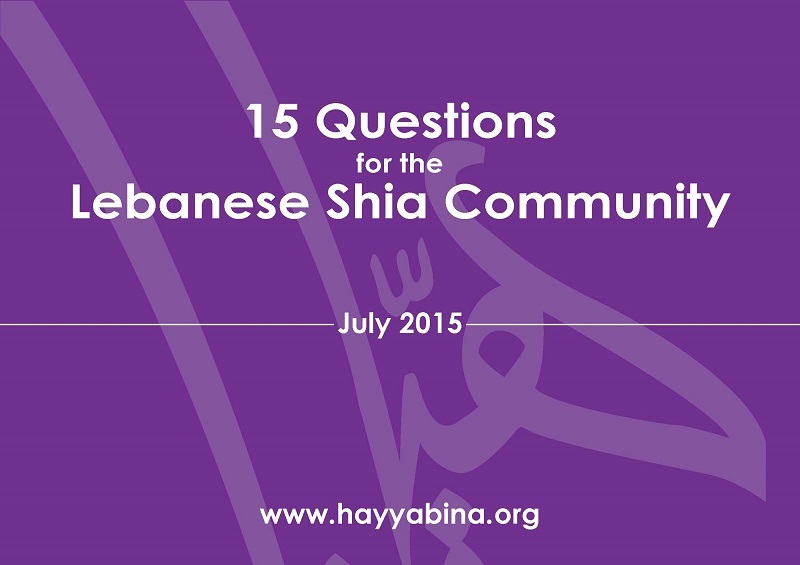 In its 2015 effort, however, Hayya Bina decided to broaden the poll to produce an open and quantitative understanding of Lebanon's Shia community—which is an essential precondition for understanding the prevailing Lebanese situation. Therefore, this latest product of Hayya Bina's research includes the far broader expanse of Lebanon’s "Shialand." In margin of the result presentation ShiaWatch suggests several "reading hints" obtained by cross-comparing some of the results and drawing attention to parallel responses. Of course, these are intended simply as ideas meant to stimulate debate. while another promised Yemeni children that Hezbollah is preparing to rush to their aid…. While Hezbollah remains deeply involved in the Syrian conflict—where favorable winds do not seem to be filling the sails of the Syrian regime and its protectors—its swift and harsh reaction to the Saudi-led intervention in Yemen seemed very much like the opening of a second front. 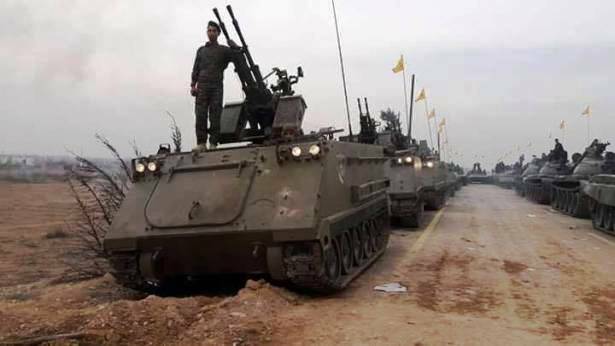 In fact, Hezbollah's response overshadowed those made by the Iranian regime and even surprised its Lebanese allies, all of whom preferred to stay well clear of a confrontation in which Hezbollah is seen clearly as a “sub-contractor” rather than the main stakeholder. For its part, Iran tried studiously to balance its response, shifting between intractable positions of principle and suggestions for a negotiated solution that capitalized—to the greatest degree possible—on the respect Iran gained by negotiating the framework nuclear agreement with the international community. Among other events that occurred in 2005, the Lebanese witnessed the assassination of Rafic Hariri, breathed the dust created by departing Syrian troops and experienced the genesis of the March 8 and March 14 coalitions. As the 2005 – 2015 decade began, most Lebanese believed they were at the threshold of a new era. Essentially, they thought the country could finally set its "national clock" to the "Lebanese Time Zone." But to paraphrase Robert Hunter, what a short and strange trip it's been. In fact, we need examine no more than three examples to understand how within that single decade Lebanon has come full circle where Syria is concerned: the influx of Syrian refugees, the "Lebanese" involvement in the Syrian conflict under a variety of "jihad" flags and the fragmentation of Lebanon's Sunni community. 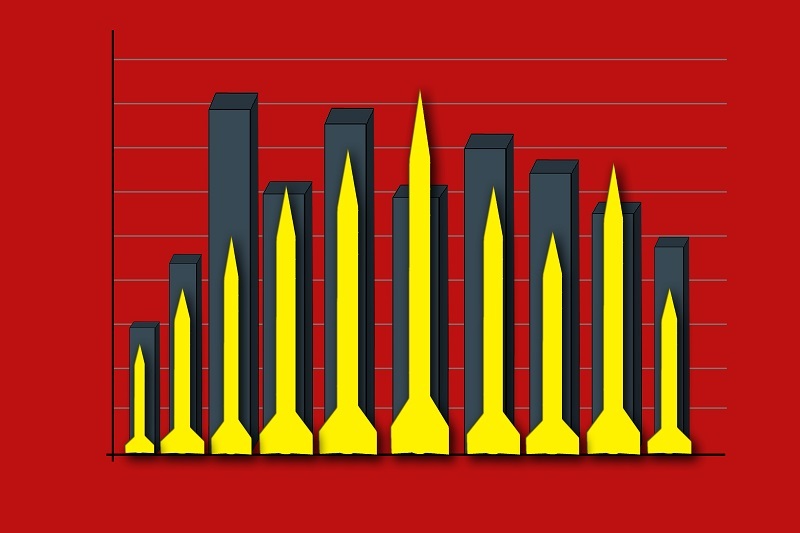 Despite the oft-cited "spillover effect" of the Syrian crisis into Lebanon, the country has remained relatively "safe." But the "hidden hands" the Lebanese trust to preserve their sense of security are becoming increasingly and alarmingly visible. Political life in Lebanon is being shunted aside as a sophisticated state of exception institutes a security-oriented approach in which a non-state actor—Hezbollah—has become the protector of the State…or what remains of it. Considering the pressure building up among Lebanon's numerous "underground" sectors, such as the Syrian refugee community, the spreading despair affecting substantial portions of the Sunni community, the never-ending political deadlock and an economy that can only be treated with life-saving measures, how long can this state of exception continue to persevere? 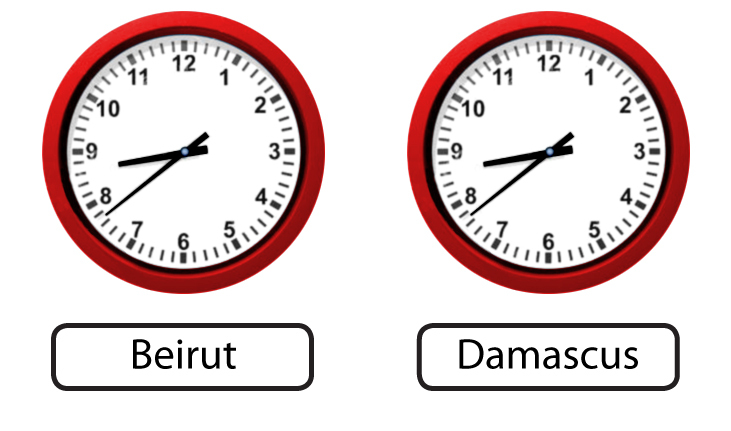 Clearly, in the 2015 version of their country, the Lebanese still set their "national clock" according to the "Syrian Time Zone." While most of the comments on Nasrallah’s post-retaliation speech focused on his threat that Hezbollah no longer considers itself bound by any “rules of engagement,” this edition of ShiaWatch tackles this newest current event from a different perspective. Here, we take the position of Lebanon's Shia community and wonder generally if, considering it is already at war in Syria, it is truly keen on engaging in another “divine” military engagement. If not, why did it need Hezbollah to score this symbolic “feat of arms?” Clearly, Hezbollah has turned the affront represented by the Quneitira incident into a zero-sum game. Lebanon’s Attrition: Possibly Worse than War? A cartoon by Arman Homsy. The legend reads: “Objects in mirror are closer than they appear”! Although the Taif Agreement which ended that brutal civil war has continued to shape Lebanon's destiny for the last 25 years, Lebanon's postwar period seems today like ancient history. The way the war was ended essentially redefined the caliber and impact of Lebanon's domestic actors, and the creeping regional polarization—referred to passingly as the Sunni-Shia face-off—has become the primary impetus for conflict. Amazingly, strife of that nature should be all but impossible in a country that prides itself on hosting a mosaic of beliefs, cultures and ethnicities. Of course, that mosaic began an enrichment process in the mid-20th century led by the Palestinian refugee community (whose stay has proven to be enduring) and followed recently by the sudden influx of Syrian refugees (a burgeoning community that also seems to demonstrate increasingly permanent characteristics). It is certainly no easy task to decipher the "code" associated with this Lebanese face-off, particularly since there is a tendency to compare conditions (and events) here in Lebanon with those that continue to define our regional neighbors, Syria and Iraq, where ghastly and expanding violence are rampant. As discussed in this edition of ShiaWatch, the Lebanese face-off is being influenced by the domestic and regional balance of power that has (at least to date) contained the most egregious examples of violence and prevented the country from descending yet again into the chasm of civil war (though there is nothing civil about that or any other war). Today, Lebanon finds itself a state beset by relentless attrition. Could it possibly be worse than war…? As Hezbollah's military, political and organizational capabilities continued to rise, the Lebanese Shia community seemed to fade. And while that outcome may seem contradictory, rather like being unable to see the forest for the trees, it deserves appropriate consideration in light of the regional maelstrom from which it is becoming increasingly evident that Lebanon cannot escape. While this quasi-simultaneous rise of an “organization” and fall of a “community” ultimately deserves comprehensive examination, the community involved never ceased showing signs of life regardless of what Hezbollah (and/or Amal) has said on its behalf or what election results may suggest as "evidence" of the will of that community. 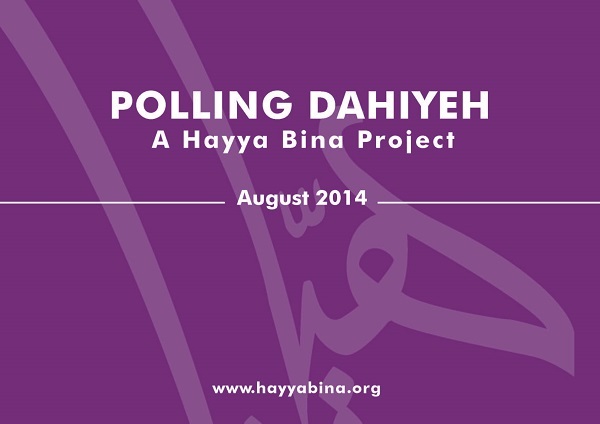 In its efforts to keep an ear trained on the Lebanese Shia community, Hayya Bina commenced a project in 2013 titled “Polling Dahiyeh.” So far, that initiative has consisted of two public opinion polls intended to get a firsthand idea of where members of the community stand on a series of important issues. Obviously, the choice of Dahiyeh is not random: the southern suburb of Beirut is the true hub for all of the profiles and sensitivities associated with Lebanese Shia. While the 2013 and 2014 polls indicated that as a collective, the Lebanese Shia community is in the ascent, the chief contrast between them is that in the intervening 14 months, Shia opinions have been shaped less by domestic Lebanese considerations than by the Syrian "factor." Specifically, Hezbollah’s involvement in the Syrian conflict was responsible for having created new living conditions characterized by the prevalence of security measures, an escalation of Shia-Sunni sectarian strife and a dramatic downturn in the local economy. 59% believe the community’s relationship with Sunnis is “bad” or “very bad” while 90% consider that “decreasing sectarianism” should remain a national priority for the next decade.